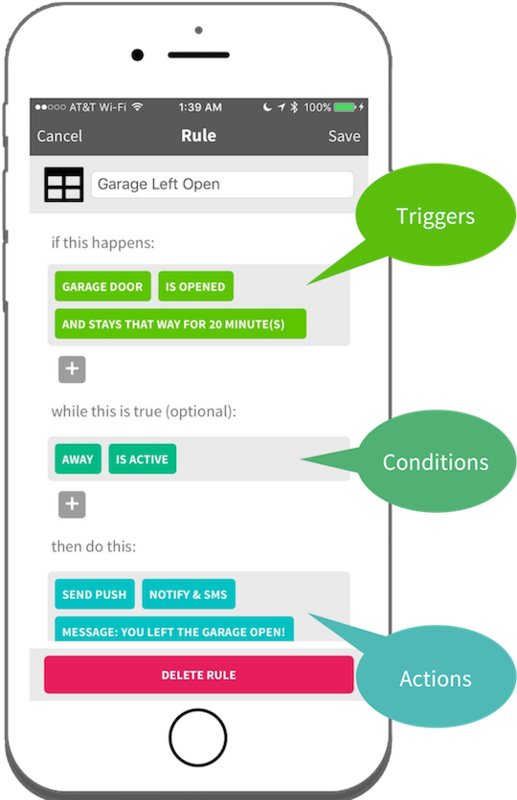 SmartRules lets you easily create rules to control your smart home. You login with your SmartThings account, authorize the devices that you’d like to trigger and control, then begin creating rules. The triggers are the things that start the rule running, for example, a specific time, or a door opening. When multiple triggers are included, any of them may individually trigger the rule. When the rule is triggered, the conditions will be checked. When multiple conditions are set, you can choose whether ALL must be true, or ANY of them must be true. When ALL is selected, then the rule will only execute if all of the conditions are true at the time the rule is triggered. When ANY is selected, the rule will execute if at least one of the conditions is true. If the conditions were found to be true, then the actions will be executed. If a delay is specified for an action, then that action will be scheduled for that time. Does my phone need to be on for the rule to execute? No. SmartRules allows you to define the rules on your phone, but the rules execute in the SmartThings cloud, just like any other SmartApp. Once the rule is saved, it no longer relies on the phone to execute. 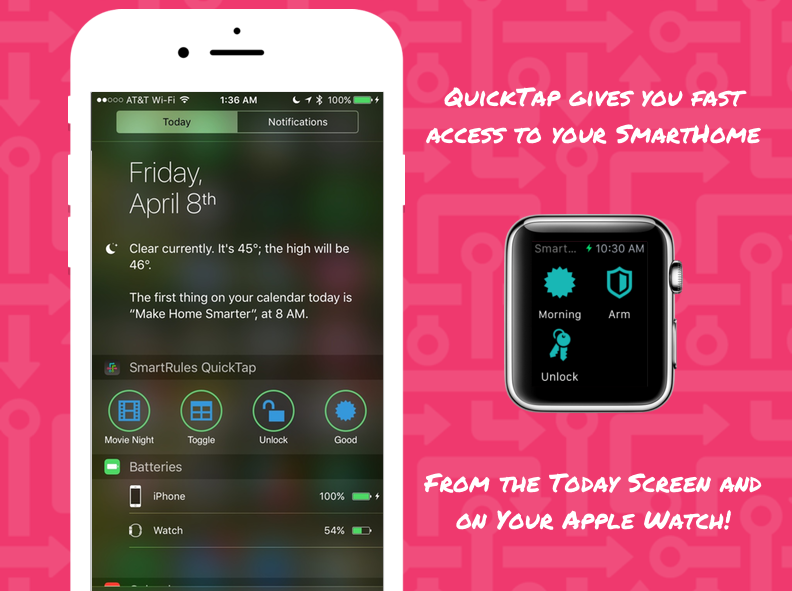 A QuickTap is a way to quickly trigger a rule from your Today Screen or from your Watch. These can be really handy for actions that aren’t automatic, but you’d like to trigger them on demand, quickly. Things like opening the garage door, or switching into night mode are perfect for this. To make your rule show up here, just include a QuickTap trigger in the "if this happens" section of your rule. You'll need to add SmartRules to the Today Screen. First, activate the Today Screen by swiping down from the top with the phone unlocked and tap "Today". Swipe all the way to the bottom of that screen and find the "Edit" button. Tap that, then find SmartRules QuickTap in the list and tap the "+" button next to it. Now, back at the top of that screen, you may rearrange the order of the various widgets. When done, tap the Done button at the top right and you should now see your QuickTap rules! On the Watch, you'll need to install SmartRules via Apple's Watch app. Swipe down through the list until you see SmartRules, then tap on it. Toggle the switch to the right next to "Show App on Apple Watch". The installation may take a minute or so, but once it completes, you should see the SmartRules icon on your watch. When you add, delete, or change rules, you sometimes may need to do a "deep press" in the Watch app, and tap Refresh to get the latest rules. Then, just tap a rule’s icon to quickly run it. You'll see the icon dim while it sends the command, then change back to normal once it is successfully sent. Why isn’t there an ALL option for triggers? A trigger is an event, not a state. Each trigger is a unique event, and it only makes sense to process each one uniquely. For example, when a door opens, there is one instantaneous event that can be used as a trigger, the door is opened, then a new state that can be checked in a condition, the door is open. Try rethinking your problem with conditions instead of triggers. Can I create rules for multiple locations? No, SmartRules does not yet support multiple locations. When you login, you can only select one location and its associated devices, then create rules for that location. We are investigating support for multiple locations and may add it in a future update. Do you store my data? Do you have access to my things? No. SmartRules never sends any of your data to our servers. The data is saved only on your phone, and in the SmartThings cloud. When you login to SmartThings, a special token is sent to SmartRules to be used for future access. This token is saved securely in the iOS keychain. The information about your home is sent securely from SmartThings to SmartRules, and the rules are sent securely from SmartRules to SmartThings using this token. Start over with the login process. When you arrive at the "Tap Here" screen, click the"Open in Safari" icon in the bottom right corner. Click the link from Safari and it will bring you back into SmartRules where the authentication should complete as expected. If not, continue with the steps below. In the Notes app on your device, create a new note and copy and paste this link (https://obycode.com/smartrules) into the note, then press Done to save it. Long press on the link (not 3D Touch), until the menu comes up. If you see an option to "Open in SmartRules", tap that and SmartRules should open up, then you should try logging in again. If the "Open in SmartRules" option is not available, continue to follow the steps below. Verify that you have the latest version of iOS installed. Help, my scheduled rule didn’t run! SmartRules relies on SmartThings to handle scheduled events, and unfortunately, sometimes their scheduler fails. Check here (http://status.smartthings.com) to see if they’re currently having known issues. If this happened to you, you may sometimes need to re-save the rule to re-initiate the schedule. 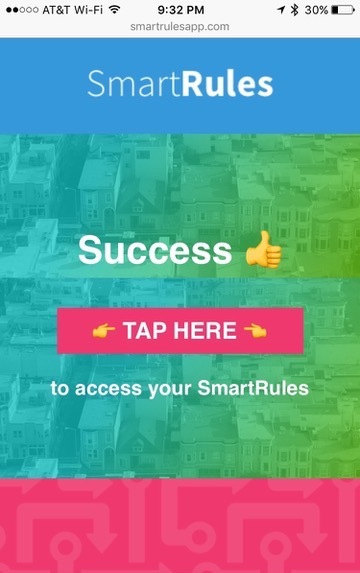 In the SmartRules app, just open the rule, then hit “Save”. This will cause the rule to be re-scheduled in the SmartThings cloud and usually solves the problem. 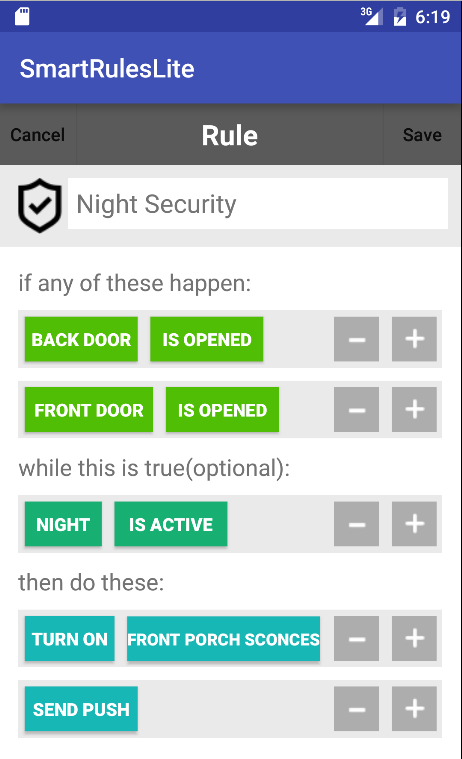 Why can’t I create a rule that controls or is triggered by Smart Home Monitor? SmartThings has not given us an official way to interact with Smart Home Monitor, so for now, we cannot include it in our rules. If they open up an interface, we will definitely add it to the app. Do my rules run locally on my hub or in the cloud? For now, your SmartRules can only run in the SmartThings cloud. SmartThings has not yet given access to any third party SmartApps to run locally on the hub. If they do, we’ll be sure to do what needs to be done to get your rules running locally. There will of course be limitations, depending on which devices and what actions you use, but some should definitely be able to run locally. How can I add or remove devices that SmartRules can access? 1 - In SmartRules, go to the settings page and logout. When you log back in, you will go through the device authorization process again, where you can modify your selection of devices. Can I backup my rules? Can I dump my rules to see them all in one place? Yes. On the settings screen, you can tap the “Export” button. This will generate an email with all of your rules written out in a format that is easy for you to read. There will also be a file attached that contains your rules in a format that is easy for the app to read. Send this email to yourself and keep it as a backup. To import your rules from the backup, long press on that file and select “Copy to SmartRules”. SmartRules will open and the rules will be added. If any of the devices from a saved rule are not available, that rule will not be imported. Everything is broken! How can I start fresh? What is this about a subscription? We have several ideas that would require some ongoing costs on our end. Only those features would require a subscription and it would be completely optional. You will be able to create and use rules without those specific features without the subscription. When are you going to make an Android version? Didn’t find an answer to your question? We’d love to help.